The first Mass in the town of Sutton was celebrated on June 15, 1871 in a tent used by workers on the newly-laid railroad. In 1876, a group of Catholics purchased Sutton's original school building and renovated it for use as a church. As the Catholic population in Sutton increased, a larger church was constructed in 1878 and later enlarged in 1893. The cornerstone of the present church was blessed on June 19, 1906. 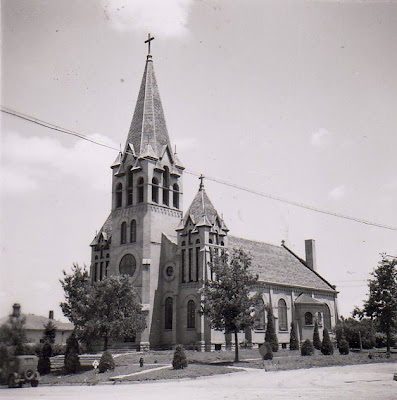 The church was dedicated on October 9, 1907 by Bishop Thomas Bonacum and 21 other priests. The exterior of the neo-Romanesque church has changed little since. It's also worth noting that the exterior is quite similar to that of St. Stephen Church in Exeter. The two towns are only about 20 miles apart and these two churches were built within 5 years of each other. Perhaps the same architect was utilized? The interior features a unique triple barrel vaulted ceiling that allows the nave to be free of columns. The interior is simple with clean, sweeping lines. View from the Altar. The large choir loft window was destroyed in a storm in 1994. A new window was created as an exact replica of the former. Interestingly, the high altar does not reside within an apse, but is along the same wall as the side altars. A window of the church's patroness is above the high altar. 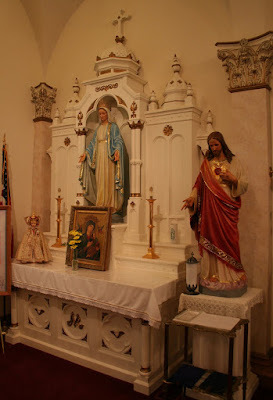 The formal name of the church is actually Immaculate Conception, though over time it has become commonly known simply at "St. Mary's." A fine green marble font holds a place of prominence in the Baptistery near the entrance of the church. 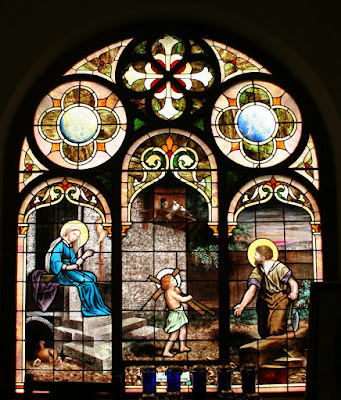 A unique window depicting the Holy Family. Mary is shown spinning, while Joseph is busy about his carpenter's work. The boy Jesus assists by carrying a measuring stick and some lumber - shaped as a cross. Sutton was settled primarily by Irish immigrants. 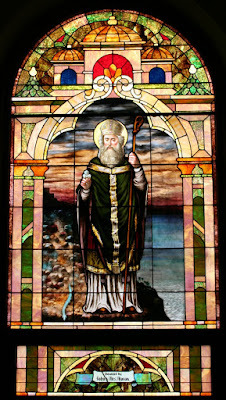 This presence is alluded to by this window of St. Patrick. A striking and colorful image of the Good Samaritan is found above a former confessional area. Now this is just about perfect ... I have to commend the parish on maintaining the historic integrity of this church over the many decades. Reconstructing the destroyed balcony window in the image of the former one serves as an example of that. Yes! It is a wonderfully preserved church! Glad you enjoyed it!